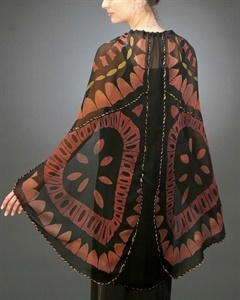 These fashions are created using a variety of techniques including shibori, fabric collage, quilting, embroidery, beading and hand dyeing of natural fabrics and fibers. 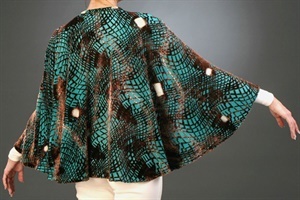 Loose fitting soft silk organza tunic. Created using stitched shibori technique. Hand dyed. One size fits most. 27" length. 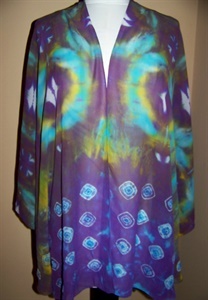 Loose fitting soft silk organza tunic. Created using stitched shibori technique. Hand dyed. One size fits most. 29" length. 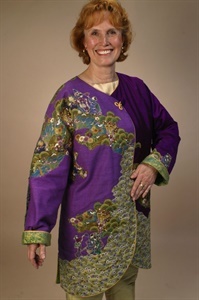 Loose fitting soft silk organza tunic. Created using stitched shibori technique. Hand dyed. One size fits most. 28.5" length. 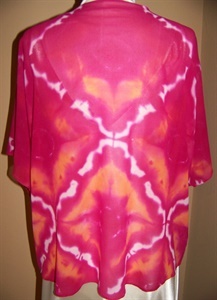 Loose fitting soft silk organza tunic. Created using stitched shibori technique. Hand dyed. One size fits most. 32" length. 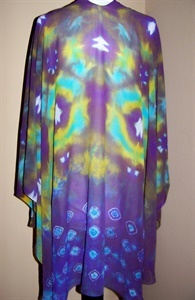 Hand dyed shibori "tranformed" silk chiffon/organza float with bead trim. 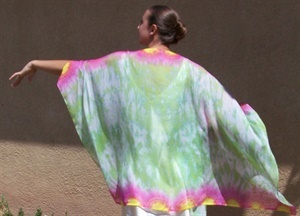 Hand dyed transformed silk chiffon/organza panels form cape and overlay on skirt. 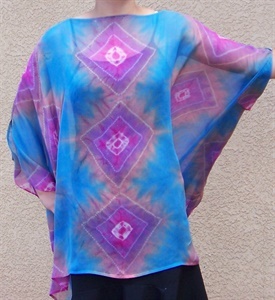 Camisole is hand dyed silk charmeuse; skirt is hand dyed silk habotai. 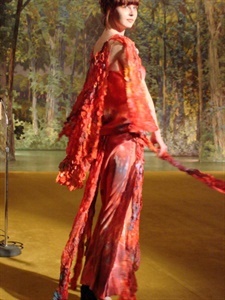 Featured design for 2007 Bernina Fashion Show. 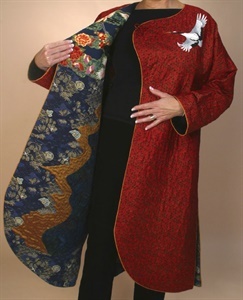 Silk shantung and silk dupioni quilted and embellished coat, with hand dyed silk lining. Silk shantung long skirt with quilted "apron" and strapless fitted top. 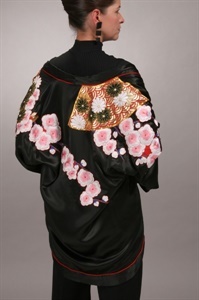 Hand painted silk organza jacket. 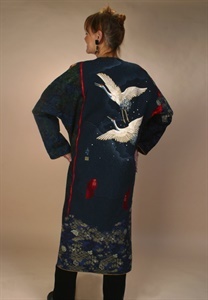 Embellished with hand cut "feathers" and fibers. 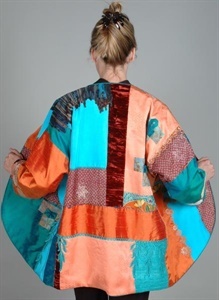 Tea dyed, overdyed and discharged silk organza opera coat with fiber embellishment. 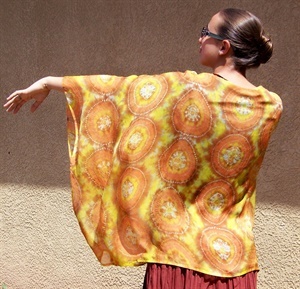 Silk chiffon hand dyed shibori cape - back. Fits most. 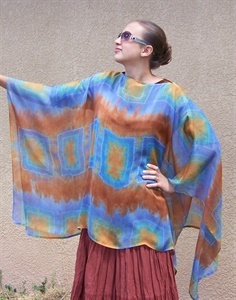 Silk chiffon hand dyed shibori cape - front. 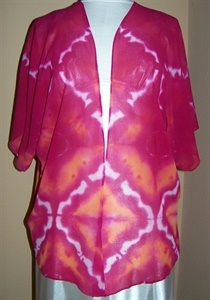 Silk chiffon hand dyed shibori jacket - front.